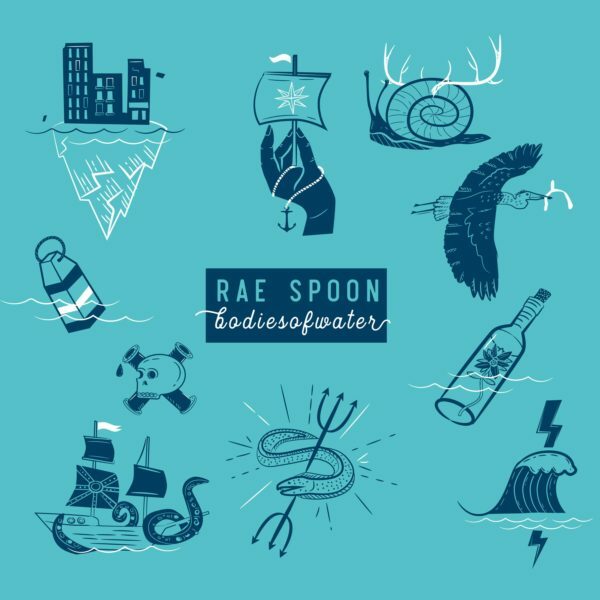 Rae Spoon’s bodiesofwater comes out on the twentieth anniversary of the first show Spoon ever played, and ten years after the release of their break-out album superioryouareinferior. As a non-binary person, Rae is no stranger to having an identity that doesn’t fit societal and legal structures. Like bodies, water is regulated and increasingly commodified, despite being fundamental to life. On this, Spoon’s ninth album, they explore their common ground and connections with the ocean surrounding their Vancouver Island home. Co-produced by Montreal’s Laurie-Anne Torres (Folly & the Hunter, Land of Talk), bodiesofwater was recorded with Torres, respectfulchild, and Terri Upton at The Noise Floor Recording Studio on Gabriola Island. Infectious arrangements of drums, ambient violin, synthesizers, and bass guitar carry the listener through ten new songs highlighted by Spoon’s characteristic layered songwriting. Expansive and hopeful, Spoon’s voice acknowledges the complications and complexity of despair while maintaining a genuine sense of hope and connection. The album opens with “I Held My Breath,“ a song emanating the strength and fragility in confronting sorrow and anxiety. The anthemic joy of “Do Whatever the Heck You Want” encourages listeners to challenge the limitations they put on both themselves and others. Other songs, such as “It’s Getting Close” and “Bioluminescent,” explore the apocalyptic possibilities in the current global climate, while the role of politicians in determining the future of the land and sea is confronted in “You Don’t Do Anything.” “Seascape” seeks to destigmatize the methods people use to survive a lack of social support, and the song “In My Town” challenges music and art scenes to better address allegations of sexual violence while supporting survivors. “Undertow” proclaims the advantages of embracing change and “It’s Not in My Body” is about longing for the space to simply exist as a body without constantly negotiating the questions of others. Finally, in “Beach Of Bones” Spoon finds connection with the water, air, and land by experiencing them as living parts of the world in which we are embodied. Limited light blue vinyl pre-order. Release February 15, 2018.